Egg & Rice Breakfast Skillets can be made for one in any small skillet or made for a family in a large one. 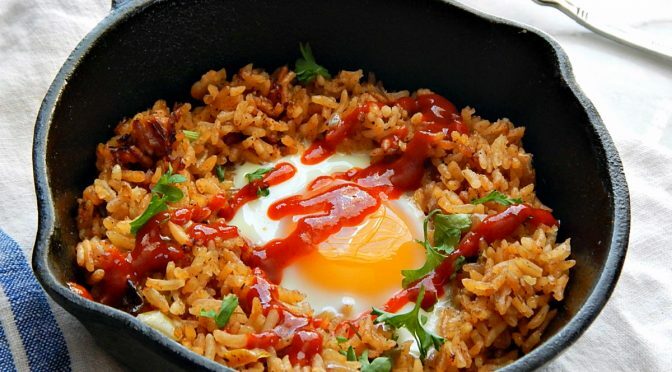 It helps to have a heavy bottomed skillet because it’s really a beautiful dish if the rice gets just slightly toasted on the bottom, soft and warm on the top and the egg cooks through just to your liking. Although it’s pretty much hands-off, it does take a bit of time to cook the egg through. I like to heat the rice through first, then drop the egg into a well and cover the whole works with a lid. Keep this back-pocket recipe in mind and you’ll be hoping for leftover rice. And of course, you can add all kinds of goodies to this dish if you’re working with plain rice. Leftover or sauteed veggies, ham (do you still have any Easter ham stashed?) bacon, pulled pork, etc. Make it your own. Since you’ll be using leftover rice to start, the whole meal is really a “save.” Think about all those rice dishes you might normally toss because all the “good stuff” has been scooped out, leaving the rice behind! Rice is one dish that needs some care if you’re planning to use it leftover. It can harbor a bacteria that won’t be destroyed by cooking. Refrigerate rice promptly after a dinner so you won’t inadvertently give it a chance to take hold. Whether making for one or a crowd, this simple method works for almost any leftover rice dish! Add oil to a heavy bottomed skillet and heat to medium-high. Add rice (add a little water if dry) and place a lid on the skillet while the rice heats, about five minutes. Remove lid, make a well in the rice for each serving of egg (one or two eggs per person) and crack egg into well. Reduce heat to medium. cover again and cook for four to seven minutes until egg is cooked to your liking. Pay attention to the smell of the rice. A little toasting on the bottom of the skillet is wonderful but if you detect any burning, move the skillet off heat for a minute, then continue to cook at a lower heat level. I’ll be sharing Egg & Rice Breakfast Skillet at Fiesta Friday #219, hosted this week by Jhuls at the Not So Creative Cook. Do stop by their sites when you have a minute – Fiesta Friday is a fun link up from some of the best bloggers and you’re going to fall in love with Juhl’s site! This entry was posted in Click here for Bargain Meals, Click here for Fabulous Food Posts and tagged Breakfast or Brunch Dish, Eggs, leftover rice, Rice. Bookmark the permalink. I love eggs and rice, but never thought to do this. Nice change, that. And it would be a great car camping breakfast (or dinner)! Oh yes!! I’ve been doing more car camping since I’m passing on from vintage to antique, lol!! You’ll have to try this with leftover Jambalaya!! It’s the one of the best things, ever!! It’s kind of a fun “no recipe” recipe! I had to warm up to eggs. I was so sick in the mornings when pregnant with my daughter that somehow I associated eggs with that for decades! She’s over 30 now, and I have just started eating eggs more again! Wonderful as a gluten free option, I could eat this for dinner. That’s such a good point, Liz, about the gluten free! Thanks, and it’s really so good, it hardly seems like it could be leftovers! I love how easy this is breakfast dish is, and it looks so delicious, too! It would actually be great for any meal! Thanks much! What I love about this is that it takes on any flavor from your rice, so it’s different every time. I never get tired of it.